The look of rich black lacquer. (Custom imprint optional on quantities. Not just a calculator...also world time clock, calendar, calculator and countdown timer...with executive-class style. Have you been frustrated by cheaply made calculators? 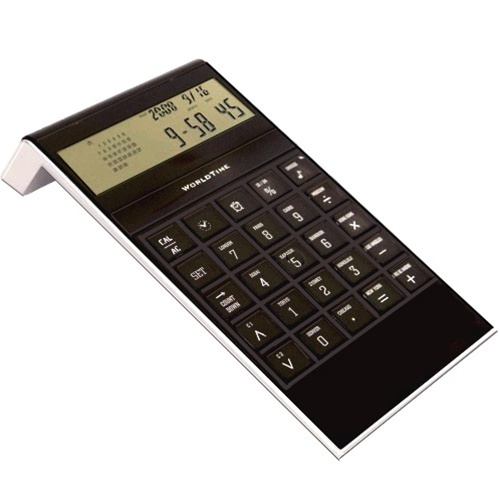 This is the classiest-looking desk calculator we've seen, and it's also a super convenient world time clock. When in the time mode, just push a button corresponding to one of 16 world cities and see the selected time instantly. The photo doesn't do justice to this spectacular desk calculator/clock. Great executive gift and a great item to imprint with your logo or company website (quantity orders only). Uses one button battery, provided. Black lacquer-look. Great gift idea! Leather Detachable-Wheeled Chicago Laptop Case, by McKlein Coast Mini Tac Pocket-Size LED Tactical Flashlight LaCrosse Digital Altimeter Watch with Compass Travelpro Digital Travel Luggage Scale -- NO MORE OVERWEIGHT FEES!